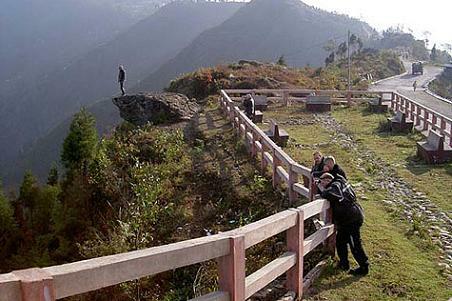 Sikkim Tour gives the visitors a complete over viewing of the Himalayan destinations that Eastern Himalayas has to offer. Though fast changing, it upholds the blend of being very much in the Himalayas. Darjeeling - the British retreat during Colonial Raj and Sikkim - the last remains of the lost Kingdom are the main tourist destinations. In the morning we drive to the airport for the flight to Bagdogra. After the arrival in Bagdogra we proceed north of the state through the coniferous forests and terraced tea gardens to Darjeeling. Darjeeling (place of the thunderbolt) has spectacular scenery. 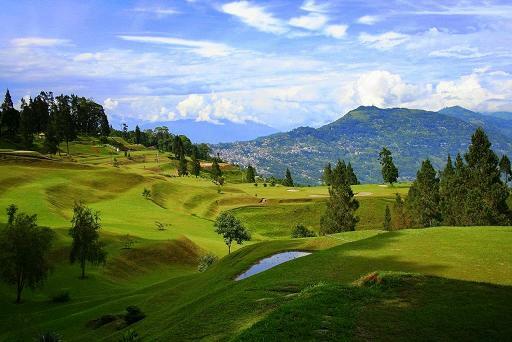 Due to its altitude of 2134 m and soothing temperature in summers Darjeeling has become a famous hill resort in India. By clear weather we can enjoy the impressive and unforgettable views of the Himalayas. 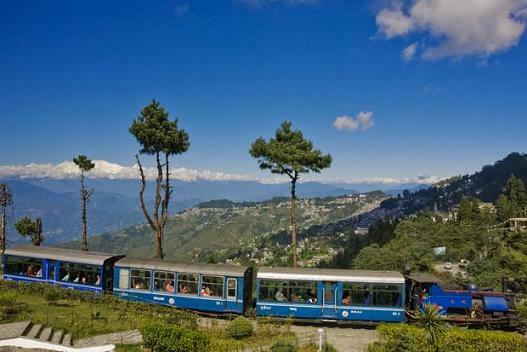 Upon arrival, you will be transferred to the hotel in Darjeeling. Early in the morning we drive to Tiger Hill (around 11 km) to enjoy the sunrise. Tiger hill (2590 m.) is the highest point in this area. There is a breathtaking view of the sunrise on Kanchenjunga. Mount Everest (8842) is also visible on a clear day. The moments of sunrise from Tiger Hill are described by most of the visitors as unforgettable. In the afternoon we explore Darjeeling and its surroundings. We visit the village Lablong and the institute of mountaineering where we get the detailed information about the natural surrounding and the habitants of this area. Today we drive in the morning to Pemayangtse a fascinating journey that winds through steep climb down through tea estates across River Teesta. We enter into west Sikkim winding along the river Rangit where panoramic view of the Kanchenjunga and the entire row of peaks are awaited. Early in the morning we have trek to Sangacholing monastery where sunrise over Kanchenjunga and the adjoining peaks can be seen on a clear day. After the breakfast we pay a visit to the Pemayangtse monastery, it is one of the finest in Sikkim and the second oldest, built in 1716. It is an impressive and beautiful building which houses the unusual Sangdok Palri "Temple of Heaven" which contains a wooden figure that took 7 years to carve single handedly by the late Dugzom rinpoche. In the morning after having breakfast we leave Pemayangtse and drive to Gangtok. The capital of Sikkim 'Gangtok' lies on a ridge overlooking the Ranipool river. Gangtok ("High Hill") lies at an altitude of 1760 m. Gangtok is surrounded by the mountains, especially from Kanchenjunga range. Upon arrival, you will be transferred to the hotel in Gangtok. In the evening we visit the Mountain Lake at Indo-China border at 12400 feet which is the Tsomgo Lake. Today we visit Tsuk-la-Khang, the royal chapel which is standing on a high bridge. This is the major place of worship and has a large and impressive collection of scriptures. We also visit the institute of cottage industries which is an attraction as a wide range of local handicrafts in Lepcha style are produced here. Today we also drive to the Enchey monastery. This monastery is believed to be 200 years old. The monks of this monastery belong to the Mahayana Buddhism. Today we visit the unique Research Institute of Tibetology on a hilltop which was established in 1958 to promote research on Tibet and Mahayana Buddhism. Here we will see the biggest collection of tibetan scripts and an excellent collection of rare Tankhas, bronze and cult objects. We also visit Orchid Sanctuary which is laying south of the institute. This sanctuary contains over 450 indigenous species. Sikkim is considered paradise for orchid lovers. After the visit of sanctuary we walk through the bazaar of Gangtok through the area of old palace. Today in the morning we visit the Rumtek monastery. 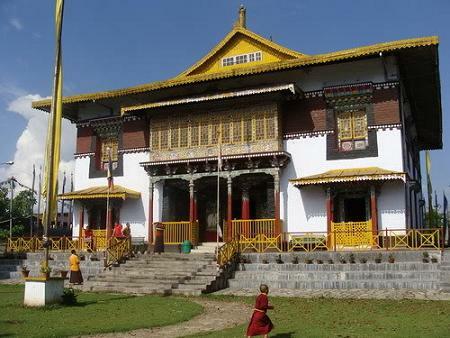 Rumtek monastery was built as a true copy of a tibetan monastery in recent years. 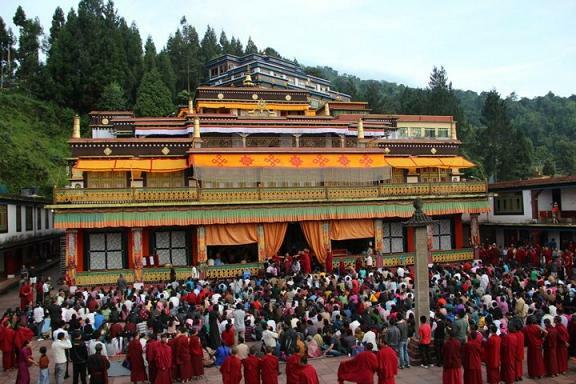 Rumtek is the headquarter of Red hat sect of tibetan lamaistic Buddhism. After visiting this monastery we drive to Kalimpong. 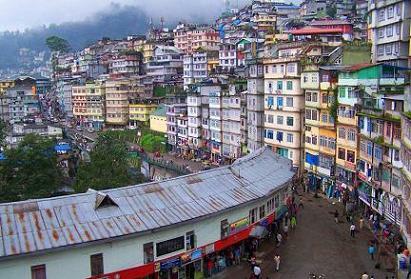 Kalimpong, a remote hill station has been a meeting point of the once "three closed lands" on the trade route to Tibet. The beautiful mountain scenery and the abundance of flowers have made Kalimpong an attractive resort. The lifestyle of the local people reflect the social and religious influences of its neighbouring nations, Nepal, Tibet and Bhutan. In the evening arrive in Kalimpong. In the morning after having breakfast we visit the monastery of Tharpa Choeling at Tripai which houses a library of Tibetan manuscripts and Tankhas. It belongs to the yellow Hat sect. After visiting the monastery we drive up to Darpin Dara, the highest point in Kalimpong with superb views over the plains. In the morning we drive through the wild Tista valley to Bagdogra. In the afternoon we drive to the airport for the flight to New Delhi. In the evening arrive in New Delhi. Rooms are available to get refresh before departing for the airport. The rest of the day at leisure. After dinner we leave the hotel for the airport. All transportation as per itinerary by Tata Sumo. Any expense of personal nature like laundry, telephone calls etc.